Ever wonder if you can see the space station with the naked eye? The reason why water with oil boils faster than water alone? The deepest hole ever dug and for what reason? 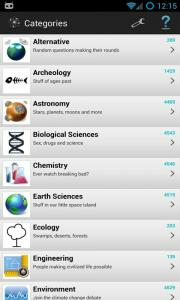 Science Questions is a fun app where you can test yourself on a multitude of science questions broken up by categories (physics, chemistry, maths, geography, astronomy etc.). The questions cover many topics with varying degrees of hardness. 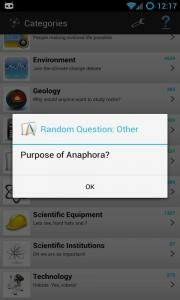 The app contains over 40,000 questions and answers! The best part of using the app is the ability to get notifications for random questions throughout the day. This way, you can learn about the various topics in a casual and fun way. Due to the extremely large question set (over 40,000!) 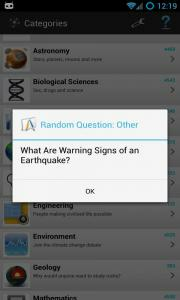 the app also provides an easy way to see random questions and their answers. This app is perfect if you want to learn more about scientific topics whether you are a student, a busy parent, a professional or really anyone with an interest in science.